Beautiful climbing on steep, juggy black rock, Going Nuts would easily be the best 5.6 route at most climbing areas in the world. Ascending the midst of the large face under the arch left of Solar Slab, it follows thin crack systems and a juggy face on plates, passing the left end of the arch on the second pitch. The plates at the first pitch belay and on the second pitch are beautiful and offer unique climbing. The top of the second pitch is a large bushy ledge, and it’s a short walk to the right to join Solar Slab’s second pitch belay. 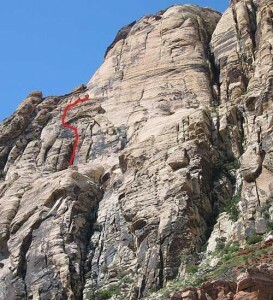 There is some loose rock on this route, especially on the second pitch after the arch is passed. It would be possible to retreat from the first pitch belay by leaving a few large nuts; two ropes would be required. Which SuperTopo guidebooks include a topo for Going Nuts?